This month we celebrate the “gift of Life”—Jesus Christ. As believers, we have the privilege of not only receiving this Gift, but also of giving this Gift of Life to others. You might ask, “How do we do that?” The answer is: by actually living Christ’s Life and sharing His Love. There’s a huge difference between asking Christ into our life to be our Savior (receiving that Gift), and intimately knowing Him as our life itself and being a “living example” (giving that Gift). That difference is evidenced by how strong our faith is. The real test of faith comes when we can trust God even in the depths of our trials, even before the victory is realized and even before the promises are fulfilled. This kind of faith has to pass the test of disappointment and the urge to want to quit. We must not only claim God’s promises, but also have the faith to walk them out even if we never see them fulfilled! This is what makes us “living examples” of what we believe and allows us to produce the “fruit of the Spirit” regardless of what is going on in our lives. For more than forty years God provided everything the Old Testament saints needed. He provided guidance by the Pillar of Fire. He provided their daily “manna”. He provided the tabernacle for their worship. He provided their daily clothing, their deliverance from their enemies, and even their shoes. But, when the going got really tough and they no longer saw His Hand, the Israelites turned against Him. They forgot His promises and they impugned His faithfulness. I see a parallel to many believers today. God provides for all of our needs, but sometimes He doesn’t do it in the way we think He should, thus we end up doubting His faithfulness just like the Old Testament saints did. As New Testament believers, it’s imperative that we learn from their example. We must unconditionally trust the Lord, knowing that no matter what we see, think or feel and no matter what He has allowed in our lives, in His timing and in His way, He will be faithful to all His promises. God’s reward for this kind of faith and this kind of obedience is not only experiencing more of His Love and His Life here and now, but the promise of a future position of responsibility in the coming kingdom. Our usefulness to the Lord is not determined by how much we suffer or by how much we lose in this world, but by how much faith and obedience we learn through that suffering and loss. Consequently, we must continually examine ourselves and see if we are continuing “in faith” and continuing to produce “fruit,” because it’s very easy to get derailed and sidetracked. Even in the worst of circumstances, we must “choose” to have faith and allow the Lord to use us and produce “fruit” in our lives despite everything that is going on. Remember the Old Testament example of Joseph. The story goes something like this: As a young man, God gave Joseph some incredible dreams that contained mind-boggling promises for the future. Yet as Joseph shared these dreams with his brothers, it left them seething with jealousy. Because of this, they captured Joseph, threw him into a pit and ended up selling him to a caravan of merchants on their way to Egypt. Joseph was then bought by Potiphar, a high-ranking Egyptian official. Joseph continued, however, to have horrific personal problems. Potiphar’s wife repeatedly tried to seduce the devout young Hebrew, and finally accused him of trying to molest her. As a result, Potiphar, understandably, threw Joseph into prison, where he endured another 13 years. He was finally released as a result of some divinely orchestrated circumstances. All through his long years of imprisonment, Joseph continued to look to God and continued to minister to those around him. If you carefully read the Scriptures about this time in Joseph’s life, you will see that all who came into contact with him recognized that “God was with him.” (Genesis 39) In other words, even in his most difficult of times, he was still a “living example” that God was real and that God cared. I don’t believe Joseph could have survived all those years of torment (from his brothers, Potiphar’s wife and prison life) if not for his unwavering faith and belief in the goodness of God. In the end, as we all know, the Lord choose Joseph to become the Prime Minister of all of Egypt, and through him He saved Israel. God has given us His authority and His power to make these kind of faith choices. It allows us to acknowledge that “yes” we are going through extremely difficult times, but nevertheless, we are still choosing to follow and trust the Lord. 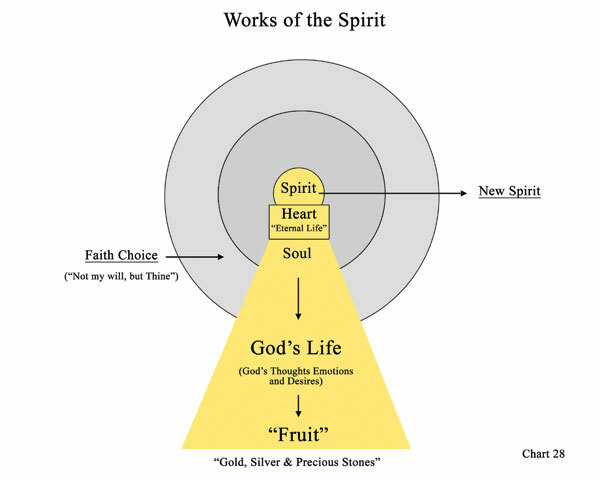 Chart 28 is what walking by faith, showing forth God’s Life and producing “fruit” might look like (above). 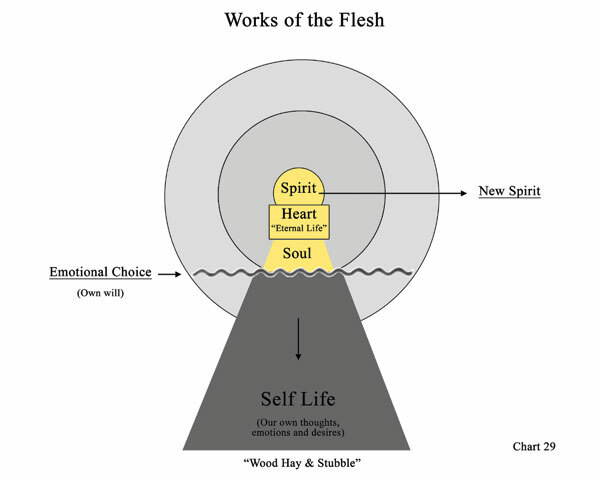 If, however, the source of our works is our own will and the actions are performed through our own power and strength (even though we are believers), it will be a “work of the flesh”. Because God’s Spirit is quenched in our hearts (we have chosen our own will over God’s), we will be unable to show forth God’s Life (His Love, His wisdom and His power) and thus, no real “fruit” will be produced. These “works of the flesh” will be classified as the “wood, hay, and stubble” that will be burned at the Judgment Seat of Christ (1 Corinthians 3:12; Galatians 5:21). Chart 29 is what this might look like. Receiving the “Gift of Life” not only makes the Lord our Savior, but also gives us the ability to know Him as our Life itself and to give his Love and Life to others, no matter what difficulties we are facing. December 2012 Personal Update News Journal.